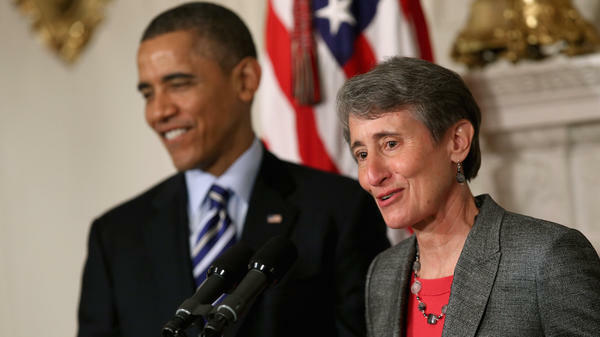 REI CEO Sally Jewell delivers remarks Wednesday after being nominated by President Obama to be the next secretary of the interior. One thing not on her resume is government work — something Obama pointed out when he announced her nomination. "Even as Sally spent the majority of her career outside of Washington — where, I might add, the majority of our interior is located — she is an expert on the energy and climate issues that are going to shape our future," he said. "She is committed to building our nation-to-nation relationship with Indian Country. She knows the link between conservation and good jobs. She knows that there's no contradiction between being good stewards of the land and our economic progress — that, in fact, those two things need to go hand in hand." It's the interior secretary's job to referee bitter struggles over natural resources, such as the current controversy over drilling for oil off the northern coast of Alaska. Usually, the job goes to a Western politician — someone with a track record on these issues. So the president's nomination of a relatively obscure CEO has left some of the key players unsure of how to react. "I was kind of surprised. I was not expecting Ms. Jewell to get this," says Tim Wigley, who heads the Western Energy Alliance, a group representing oil and gas producers. Even though their business is booming right now, they want to see more drilling on public lands, and Wigley sees reason for hope in the fact that Jewell started her career in the Oklahoma oil fields. "Clearly, her background, being a petroleum engineer — we hope that we'll be able to work with the administration and try to get some production up, particularly on federal and public lands out West," he says. But Jewell's oil career is far behind her. Nowadays, she runs a company with a more granola image — REI still calls itself a cooperative. In 2009, she gave a talk at the University of California, Berkeley about her belief in environmental sustainability, as long as it's economically viable. "You can just go down in flames with a social consciousness and not have a thriving business," she said. The fact is, REI has done well under Jewell's leadership — and she's been well compensated for that growth, earning $2 million in 2011. At Berkeley, Jewell seemed well aware of the awkward balancing act in trying to be green while selling people more stuff. "Most of us who are active in the outdoors have a garage full of gear. And wouldn't it be cool if we could get that gear into the hands of somebody that wanted to get into the outdoors and couldn't afford it — so that we could then justify buying new stuff?" she said to laughter from the crowd. "And, somehow, I have to facilitate that." There's certainly no doubt about her outdoorsy credentials. Jewell grew up in the Seattle area, sailing on the sound and camping with her family. "We've climbed Rainier together," says Bill Chapman, who serves with Jewell on the board of Mountains to Sound Greenway, a local conservation group, "and we've climbed the highest peak in Antarctica together — Mount Vinson — and she's as strong and level-headed as they come." As official Washington tries to figure out where Jewell falls on the continuum between tree-hugger and drill-baby-drill, Chapman says Jewell won't impress anyone who's looking for an "absolutist." President Obama's new choice to lead the Department of the Interior comes from the business world. She is CEO of the outdoor equipment supplier REI. PRESIDENT BARACK OBAMA: For Sally, the toughest part of this job will probably be sitting behind a desk. I suspect she'll want to get out of the office quite a bit. CORNISH: Sally is Sally Jewell. Before she took the reigns at REI, she worked in the financial industry at Washington Mutual. Before that, she was an engineer in the oil business with Mobil. SIEGEL: One thing not on Jewell's resume, government work, and President Obama pointed that out today when he announced her nomination. OBAMA: ...she is an expert on the energy and climate issues that are going to shape our future. CORNISH: As NPR's Martin Kaste reports, Jewell's selection came as a surprise to some who deal with the Interior Department. MARTIN KASTE, BYLINE: It's the Interior secretary's job to referee bitter struggles over natural resources, such as the current controversy over drilling for oil off the northern coast of Alaska. Usually, the job goes to a western politician, someone with a track record on these issues. But this time around, the president has nominated a relatively obscure CEO, which leaves some of the key players unsure how to react. TIM WIGLEY: I was kind of surprised. I was not expecting Ms. Jewell to get this. KASTE: Tim Wigley heads the Western Energy Alliance, a group representing oil and gas producers. Even though their business is booming right now, they want to see more drilling on public lands. And Wigley sees reason for hope in the fact that Jewell started her career in the Oklahoma oil fields. WIGLEY: Clearly, her background, being a petroleum engineer, we hope that we'll be able to work with the administration and try to get some production up, particularly on federal and public lands out west. KASTE: But Jewell's oil career is far behind her. Nowadays, she runs a company with a more granola image. REI still calls itself a cooperative. In 2009, she gave a talk at Berkeley about her belief in environmental sustainability, as long as it's economically viable. SALLY JEWELL: You can just go down in flames with a social consciousness and not have a thriving business. KASTE: The fact is, REI has done well under Jewell's leadership, and she's been well-compensated for the growth. She earned $2 million in 2011. At Berkeley, Jewell seemed well aware of the awkward balancing act in trying to be green while selling people more stuff. JEWELL: ...I have to facilitate that. KASTE: There's certainly no doubt about her outdoorsy credentials. Jewell grew up in the Seattle area, sailing on the Sound and camping with her family. Bill Chapman serves with Jewell on the board of Mountains to Sound Greenway, a local conservation group. BILL CHAPMAN: We've climbed Rainier together, and we've climbed the highest peak in Antarctica together, Mount Vinson. And she's as strong and level-headed as they come. KASTE: As official Washington tries to figure out where Jewell falls on the continuum between tree-hugger and drill-baby-drill, Chapman says she won't impress anyone who's looking for an absolutist. Martin Kaste, NPR News, Seattle. Transcript provided by NPR, Copyright NPR.